Archaeologists Have Discovered an Ancient Mosaic Skeleton That Says "Enjoy Your Life"
If you want proof that humans were pretty much the same 2,400 years ago, look no further than our new favourite reclining skeleton, which advises us in ancient Greek to, "Be cheerful, enjoy your life." Described as a "reckless skeleton" for his YOLO-inciting philosophies, the mosaic was excavated in the Hatay province on the Turkish-Syrian border, where the ancient Greek-Roman city of Antiocheia once thrived. It was found alongside two other tiled scenes, which likely adorned the dining room of an upper class home during the 3rd century BC, archaeologists from the Hatay Archaeology Museum suggest. As you can see in the image below, the middle scene depicts two figures, dressed in a toga and sandals, reaching towards a crescent-shaped symbol, and the far right scene features a single dark figure, which has been worn away below the shoulders. One of the archaeologists behind the discovery, Demet Kara from the Hatay Archaeology Museum, told the Hurriyet Daily News that the three scenes depict two things that the Roman elite took very seriously: baths and dinner. "In the middle scene, there is a sundial and a young clothed man running towards it with a bare-headed butler behind. The sundial is between 9pm and 10pm - 9pm is the bath time in the Roman period. He has to arrive at supper at 10pm. Unless he can, it is not well received. There is writing on the scene that reads he is late for supper and writing about time on the other. In the last scene, there is a reckless skeleton with a drinking pot in his hand along with bread and a wine pot. The writing on it reads 'Be cheerful and live your life.'" The far right scene, though severely damaged, is thought to depict a person throwing fire, which symbolises a warm bath. 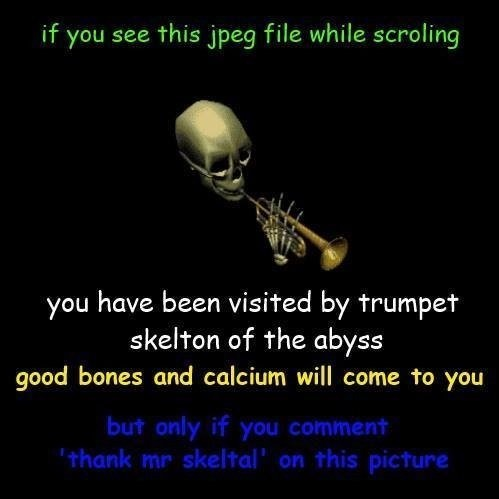 Turns out, casual skeletons were a meme long before the internet was around to celebrate their spooky dances, trumpeting skills, blendability (someone get him out of there! ), and slow reaction times on messaging boards. Thousands of years ago, rich people thought skeletons were hilarious too. As Kara told the Hurriyet Daily News, this is not the first skeleton mosaic that’s been dated to around this period - a similar one has been uncovered in Pompeii, Italy depicting a skeleton holding two pitchers because he’s clearly ready to party. And this skeleton mosaic, also found in an ancient Pompeiian villa, features a skeleton reclining next to his scythe, imploring everyone to "know they self" (or else??). The newly discovered Antiocheia mosaic is still being investigated by Kara and her colleagues, but results from their analysis are expected to be published soon.